Like I mentioned before, I have so many Halloween decorations, but wanted to whip up a few new things this year! 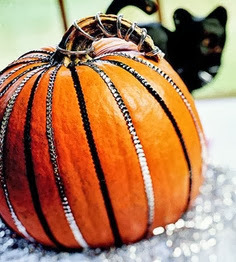 I tend to primarily use silver, black & purple in my Halloween decor (no orange - what a weirdo I know!) so I was inspired by these two pumpkin photos on Pinterest. After a trip to Hobby Lobby (where everything I wanted happened to all be 50% off on the same day!) and the Pumpkin Patch for some white pumpkins, Avery & I were ready to craft! 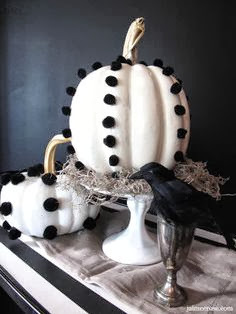 Since I have damaged a table or two with real pumpkins (if left out too long they can take the finish right off! ), we housed these lil' pumpkins in the kitchen using a glass plate & cake stand. They are playful and cute and make me smile when I look at them! BOO!